Mario using F.L.U.D.D. in Ultimate. Article on Super Mario Wiki F.L.U.D.D. F.L.U.D.D. 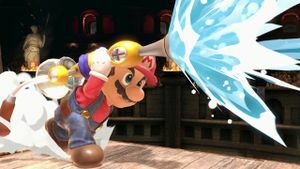 (ポンプ, Pump), short for Flash Liquidizer Ultra Dousing Device, is Mario's down special move since Super Smash Bros. Brawl. The move involves Mario taking out F.L.U.D.D. and charging it up for about a second and a half. This is an auto-charge special; so thus, pressing the special move button again while charging, or using the move after being fully charged, results in F.L.U.D.D. firing twelve globs of water a distance dependent on the charge, Like other such auto-charge moves, pressing a shield button while charging will cancel and save the charge as well as tilting left or right will make him roll with the same cancel effect (shielding/grabbing while charging in the air would instead cancel it with an air dodge), while getting hit during charging period will lose said charge. The attack does not deal any damage, instead simply pushing opponents based on the charge level. The water spray can be aimed vertically with the control stick. Should Mario use the move, he will be pushed backwards. This can aid horizontal recovery in midair. F.L.U.D.D. on Mario's back in Brawl. In most situations, being pushed by F.L.U.D.D. is merely a nuisance, not doing much but forcing combatants apart. When used judiciously, however, F.L.U.D.D. can be highly effective. Opponents that are attacking will clang with each segment of the water stream, trapping them in significant freeze frames and possibly allowing Mario to approach. More notable is the move's power at gimping - as it deals no damage and doesn't cause the opponent to flinch, it can push opponents away from the stage during their recovery without giving them another chance to use it, often not only further distancing them from the stage but providing momentum in the wrong direction. While the move does no damage, it is still a Water-effect move in Brawl, and as such it deals extra knockback to Charizard and less to Ivysaur. It was noted on the Dojo that this move can be charged while shielding; however this is not true, as shielding merely saves the current charge. With increased pushforce and range added to F.L.U.D.D. in Smash 4, Mario has a much easier time setting up his opponents to be Caped while they are still off stage. The term "FLUping" was coined by Brawl Karter to describe using the moves in tandem (F.L.U.D.D. to Cape) and denying the opponent the ability to safely recover back to the ledge/stage. Aesthetically, if Mario activates F.L.U.D.D., F.L.U.D.D. lingers for a while before disappearing, even if Mario gets Star KO'd or Screen KO'd. This feature is not present in Smash 4. "Blasts opponents with water. It can be charged and aimed at an angle." "Shoots hot water a short distance. Burns opponents on contact." "Takes a while to fully charge, but blasts opponents with torrents of water." Scalding F.L.U.D.D. : An offensive variant of the move. The spray has significantly less range, but it charges faster and does fire damage instead of pushing opponents while keeping them immobile for the duration of the move. Does 9% damage if all hits connect, regardless of charge, although fully charging the move increases its range. Does not kill until extreme percentages, but can lead to follow-ups. The move does not push Mario back as far, making it more punishable and worse for recovery. High-Pressure F.L.U.D.D. : The push effect of the water is drastically stronger than the default, so much so that when uncharged, it is the same strength as the default move fully charged. At lower charge levels it has less range than the default, but fully charging the move gives it slightly more range than the default. In return, it takes nearly twice as long to fully charge, and has roughly triple the recoil distance on the ground, as well as slightly more recoil in the air. Mario will aim the nozzle slightly downwards by default instead of straight ahead. 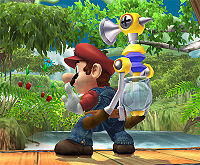 Mario using the Scalding F.L.U.D.D in Super Smash Bros. for Nintendo 3DS. Artwork of F.L.U.D.D. in Super Mario Sunshine. F.L.U.D.D. originally appeared in Super Mario Sunshine for the Nintendo GameCube. Mario encounters the device at the beginning of his vacation to Isle Delfino. It introduces itself and Mario equips it, and it comes in handy when he is forced to clean up the pollution on Isle Delfino. Although its main use is to wash away poisonous goo, F.L.U.D.D. doubles as a weapon and can be used to push small enemies away or stun them. If the water tank is emptied, Mario is required to refill it in the nearest source of water. In Brawl, F.L.U.D.D. uses the secondary purpose from Super Mario Sunshine as a defensive measure against opponents. An aqua jump occurs when Mario's F.L.U.D.D. or Squirtle's Water Gun hits any jumping character just before they begin to lose momentum. This causes the jump to rapidly speed up and double in height. It is technically not so much of a technique as a misuse of the two aforementioned moves. A multifunction water cannon invented by Professor Elvin Gadd that Mario totes like a backpack. Since F.L.U.D.D. is able to converse with Mario, it's believed to be equipped with some kind of artificial intelligence. With special nozzles, F.L.U.D.D. can be used like a jet pack to reach high places or for high-speed swimming. When Mario straps this fine accessory to his back, he takes to it like a fish to water! He can use F.L.U.D.D. 's high-powered water jets to blast himself high into the air or do a high-speed dash... Oh yeah, and he can defeat enemies and wash away graffiti. The built-in tutorial function makes anyone a pro F.L.U.D.D. user in just minutes! When Mario straps this fine accessory to his back, he takes to it like a fish to water! He can use F.L.U.D.D. 's high-powered water jets to blast himself way up high or do a super high-speed dash - not to mention defeat enemies and wash away graffiti. Afraid it'll be hard to use? No worries - it has a tutorial function, too! Origin artwork of Mario and F.L.U.D.D. from Super Mario Sunshine. Mario launches water at Luigi on Delfino Plaza. Mario fires the F.L.U.D.D. at Charizard. F.L.U.D.D. in Super Smash Bros. for Nintendo 3DS. Mario using F.L.U.D.D. (deflected by Rosalina's Gravitational Pull) in Super Smash Bros. for Wii U.
F.L.U.D.D. as shown in a Skill Preview in Ultimate. In Super Mario Sunshine, F.L.U.D.D. is used while above and behind Mario's head. In Super Smash Bros. Brawl and Super Smash Bros. 4, it is shown being used next to his right ear, with Mario grabbing the nozzle. If paused at the right time, when F.L.U.D.D. has just finished charging, the player can see a small pulse of water move outwards from Mario. If paused exactly when F.L.U.D.D. is activated from hammerspace, the player can sometimes see it without the belt on Mario. F.L.U.D.D. 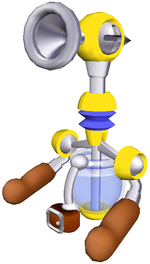 is one of three auto-charging down specials in the Super Smash Bros. series, the others being R.O.B. 's Gyro and Cloud's Limit Charge. This page was last edited on March 24, 2019, at 13:11.